To date well over 200 Universities have partnered with us to deliver their web development and digital transformation projects on our platform. You could therefore say this is a well-trodden path. And we've learnt many lessons along the way about what makes a project successful. For instance, what are the typical pressure points in a project and how they can be alleviated? What are the crucial decisions that need to be made early in a project. What governance should be in place? How do you decide whether to migrate content or to start from scratch? To name just a few. Here we've distilled down some great advice from our clients into 5 strategic points. 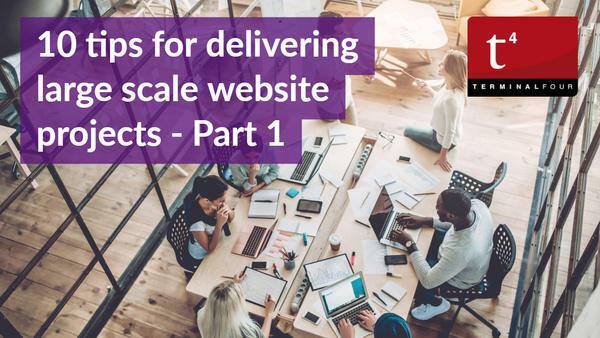 These are things we wished we'd known back in the early days of running large scale website projects. 1. Managing risk and understanding dependencies. All large scale projects involve risk. Find risks, analyze them, keep a risk register and look to mitigate them throughout the project. Identify how long you have to complete the project, how does it fit with other projects and what interdependencies does it have. And how do the project timescales fit with external activities such as the recruitment cycle. Finding software that fits with your ways of working and embedding them in your team's work in a transparent and well communicated way can really help with managing the project. Every University has a wide range of stakeholders with an interest in the website development. To make a web project a success, they need to be informed, invested and able to contribute feedback in an efficient way at the right time. Start by forming a project team with clear roles and responsibilities. Once this is in place, identify stakeholder groups and their level of involvement, and how communications will work with them. These steps will help you bring everyone onboard with the project and provide clarity on how and when stakeholders can contribute. We recommend that you spend as much time engaging stakeholders as you spend on the design phase… don't rush stakeholder engagement! Ultimately "the soft activities are the hard activities". 4. The single point of contact. Everyone has a viewpoint on usability and design and the feedback through the early stages of a web project can be extensive. Appoint a project manager to operate as the single point of contact to interface with internal audiences, to filter and summarize feedback and to liaise with suppliers. It will keep everything efficient and organized. To deliver complex projects you need the right decision makers involved throughout. Think about what the decision-making structure is on your project and how it will be effective. Identifying a single person who will be responsible for the final decisions and sign-off for the phases of the project is vital. This does not need to be your senior leadership team. Trust in this person to take onboard feedback both internally and from external suppliers and to make strong decisions for the benefit of the project. Without this, the project may stagnate in the more complex phases as it isn't clear who has the authority to make decisions, and everything then tends to slow down on the project. If your senior leadership team wish to sign off wireframes or designs then you have a bigger problem to deal with! You need to find a way of working with senior leadership that can allow you to move forward swiftly. 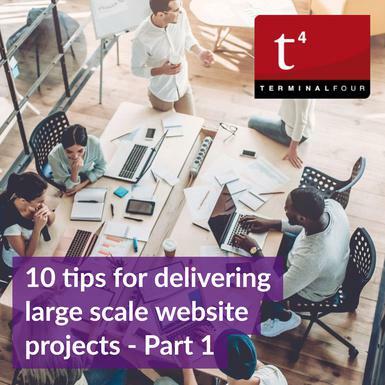 In part two we have 5 learnings from TERMINALFOUR's project management team. In the meantime, we'd love to hear your views. What's the best advice you have about running large scale digital projects in Higher Education?